In addition to the transfer of energy up a food chain, other species interactions can be important to the functioning of the freshwater, estuarine, and marine communities that comprise the Puget Sound ecosystem. Competition within and among species can influence food-web dynamics and species distribution and abundance. For example, on the rocky habitats of Puget Sound, the survival of species can depend on their ability to adapt to the vagaries of wind and waves, to compete for space, and to outgrow their predators. 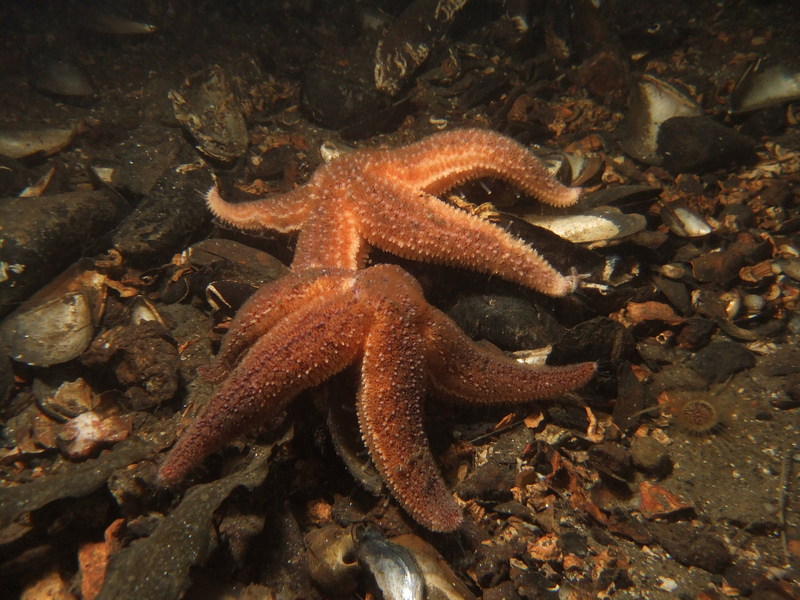 Starfish (Pisaster ochraceus) prey on mussels (Mytilus spp.) in this rocky, intertidal zone, yet these species can be found living in close proximity for decades. Where starfish are dense and have been present for a long time, there are no large mussels and local species diversity is low. However, if the mussels can survive for a few years at the high edge of the intertidal zone, or by accident or ineptness on the part of their predators, they become too large for the starfish to eat, reproduce disproportionately, and develop complex, multidimensional colonies that serve as habitat for other, smaller species. The ability of the mussels to use the limited space available on rocky shorelines also enables them to outcompete other species, such as barnacles, that vie for the same habitat areas. Eventually, because of physical disturbances and occasional predation by starfish, patches of different-aged mussel beds develop across a rocky shore, giving rise to a mosaic of habitat and species diversity. This phenomenon is not unlike the process of forest succession, whereby seedlings that survive to a certain threshold become too large for grazing predators, eventually producing canopies that serve as habitat for other species. The intentional and accidental introduction of alien species to Puget Sound through ship ballast, aquaculture, and plant propagation has had serious effects on species competition in terrestrial and marine environments. In many instances, these invaders can out-compete native species but do not fulfill the same functions within the Puget Sound food web as the native plants and animals they displace. It is estimated that at least nine non-native species of marine plants and 83 species of marine animals have been introduced into Puget Sound (WDFW pers. comm., 2006). Some of these were intentionally introduced, such as the Pacific oyster and Manila clam, to substitute for the loss of native shellfish species. Other animals have arrived through ship ballast water and other accidental introductions, including several species of tunicates or “sea squirts” (i.e., Didemnum lahillei, Styela clava, Ciona savignyi and Ciona intestinalis). Invasive species are those species alien to a particular ecosystem whose introduction does or is likely to cause economic or environmental harm or harm to human health (Executive Order 13112, 2/3/99). Tunicates are a clear example of just such a serious threat. Without known predators and with rapid reproductive characteristics, these siphon-feeding animals can out-compete or suffocate other sea life, including clams, mussels, and oysters. Styela clava, for example, can spawn every 24 hours and has ten sets of gonads, each carrying both egg and sperm. Tunicates can quickly blanket pilings, the underside of docks, traps, lines, equipment, and other hard surfaces, along with the hulls of boats—increasing the risk that the species will spread. In addition to the potential economic damage to the shellfish industry in Puget Sound, these alien invaders can create disruption throughout the Puget Sound food web. The tunicate Didemnum lahillei was first discovered near Edmonds in 2004 and has since been observed at a dozen sites including Hood Canal, Totten Inlet, Des Moines, and Neah Bay. Aggressive eradication programs have been launched to prevent the spread of tunicate species throughout Puget Sound. Although all of the tunicate species pose a serious problem, nuisance-species management experts are particularly worried about the Ciona species of tunicates that have developed dense population colonies over two miles long in Hood Canal (WDFW).